People who've worked with me know that I don't have the patience to wait on a slow computer, especially when it's booting up or shutting down. As with everyone else, I want things to run fast and smooth, but this demand increases greatly with electronic devices. The sight of popping windows, miscellaneous notifications, or unnecessary programs running in the background irritate me. I know it's my sinful nature at work, but it's also because a computer slowed down by clutter and disorganization impedes my productivity and quality of work. I guess this is part of the reason why I made the switch from Windows to Linux. Among other things, I wanted a computer that was streamlined for my needs. I wanted to have programs I would actually use. And I wanted my computer to run on its optimal speed. We advocate a minimalist (only what you need) approach to computing, both at the hardware and software levels. Only you know what you need in a computer, so “minimal” will mean different things for different people. We want to help and encourage you along your journey toward simple freedom. I learned that one crucial task is to identify what you truly need. 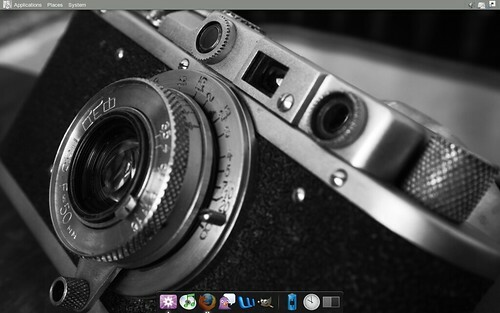 So I further streamlined my desktop, took away other applications, and installed Docky. I'm loving it. Here's a screenshot. If you're a Mac user, you may want to read Minimal Mac. If you're using Windows, try to browse through anyway, and you'll learn things you can apply in your own machine as well—especially a lesson on streamlining. The point is, "get more of what you need, less of what you don't."